I have always understood “living with dementia” to mean that that person carries on with life, knowing that there is an underlying medical phenomenon somewhere. To me, it’s exactly the same as living in recovery from alcohol dependence. If I were to have another alcoholic drink, I wouldn’t be able to stop drinking. It’s a pathological reaction. I view it in the same way that some people have an allergy to peanuts. I don’t actively think about not drinking all day – it’s just something that’s part of my life. 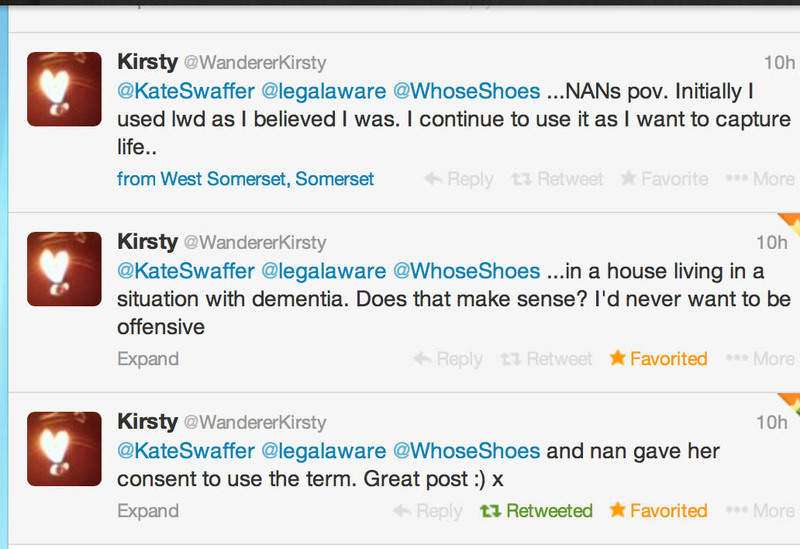 It did genuinely come as a surprise to me, however, that some individuals view ‘living with dementia’, as living with somebody close to them with a dementia. I respect this viewpoint, and it is clear that no offence is intended there as well. I don’t know what a person living with dementia (in my sense of the phrase) “feels like”, in the same way philosophically I cannot know what he or she perceives as the colour red. But an attempt to understand what one of the dementias might be like for that person I believe is pivotal for care, consistent with Tom Kitwood’s seminal work on personhood. In this framework, your prime concern is the person (rather than patient) with one of many types of dementia. A person will be a ‘product’ of experiences unique to him or her, and his or her own physical health, and not just a sum of his or her chemical receptors in the brain. For medical professionals, a diagnosis can operate at a number of levels. One is individual, pertaining to someone’s identity or concept of being ‘sick’. One can be institutional (in relation of that individual to clinicians, politicians or social movements). We have seen this year how some politicians have been clamouring for a slice of the dementia diagnosis action. One can be societal, which depends entirely on how diagnosis frames that particular entity. For example, society might view that a delayed diagnosis for a dementia, where there is no obvious reason for this delay, is simply unacceptable. A diagnosis is by no means a trivial issue. It has become powerful because of the close proximity in academic and practitioner circles between legal, insurance and medical jurisdictions. A diagnosis can have important consequences. Those consequences might be “administrative”, allowing somebody to access resources in health care; it can “legitimise” sickness (or the rather perjorative notion of “deviance”); or can encourage research into the existing evidence base. A person as a result of a diagnosis may adopt “a sick role”, after Talcott Parsons’ seminal work in 1951. This construct of ‘sanctioned deviance’ is not without its critics, who argue that this encourages a culture of blaming ‘the sick’. There is indeed more to this than immediately meets the eye. Take autism, for example. Contrary to popular assumption, people diagnosed with so-called “mild forms of autism” often don’t fare any better in life than those with severe forms of the disorder. That’s the conclusion of a recent study that suggests that even individuals with normal intelligence and language abilities struggle to fit into society because of their social and communication problems. In fact, people diagnosed with pervasive developmental disorder-not otherwise specified (PDD-NOS) are no more likely to marry or have a job than those with more disabling forms of autism, according that study. There’s been a growing realisation that diagnostic criteria are not “gospel“, and a number of medical phenomena have seen a number of patient groups query this; these include myalgic encephalitis, B12 deficiency and Lyme Disease. It can’t easily be denied though that some individuals find a diagnosis helpful in that such a diagnosis might help to make sense of the past, present, and future (see for example “midlifeguy”‘s experience here). Persons who have been given medical diagnoses have tended to find support from others who share similar experiences and there are instances of specific-issue health movements shaping medical practice and government policy. And it’s inevitably going to be the case that some diagnoses are contested, challenged and/or politicised. Indeed, diagnostic categories can, and often are, resisted or disputed. Whether you happen to agree with Kate Swaffer, ironically, is personal to you, but it’s hard to deny that that poem throws up some important questions about identity and the way others perceive you. Thanks to my dear friend Shibley for this deconstruction… a very great honour to me!